Model: The Archos Sense 50X is a smartphone with a 5-inch Full HD screen of the correct quality. Running on Android 7, it has a quad-core processor at 1.5 GHz and a main photo sensor of 13 MP. Its performance is far from exceptional, but it has the advantage of being able to withstand water and drops (up to 1 meter) thanks to its IP68 reinforced housing. The only drawback of this robust version is that it is incredibly large, given its 5-inch screen. This smartphone is aimed at users who work in difficult environments, such as construction engineers or users who do sports, such as hikers and bikers. When they are working in difficult environments or exploring the outdoors, they need a smartphone which can deal with being dropped or immersed in water. 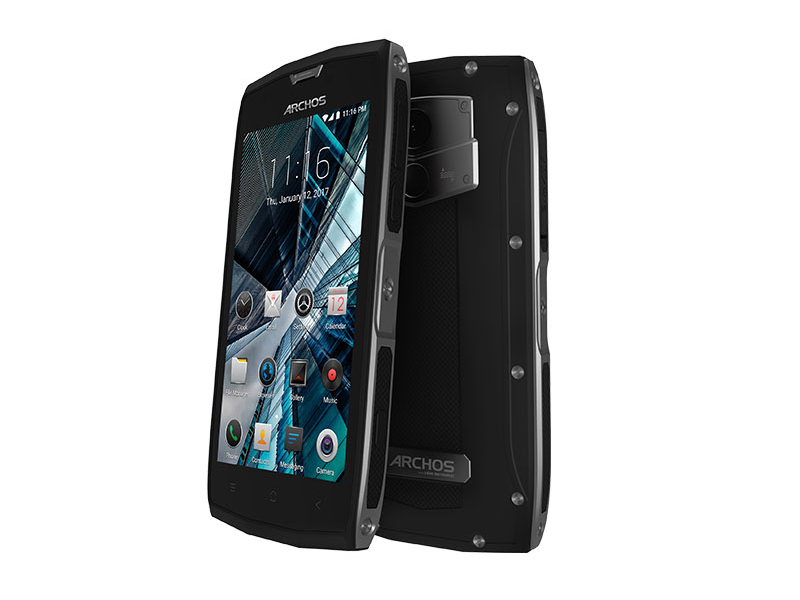 Due to its extensive protection, the Archos Sense 50X is such a phone. The Sense 50X is a Dual SIM handset with a Nano-sized and a Micro-sized SIM slot. This means users can have one or two SIMs in place in the phone at any one time. Use both a personal and work SIM card in the same phone or maybe a local and international SIM, the choice is on the user. Or, if they need only one SIM slot, they can leave the other empty. The 5-inch IPS HD screen on the Sense 50X will allow a user to enjoy all their multimedia content, even when outdoors. However, the matrix was made in IPS TFT LCD technology. When it comes to the quality of the displayed image, a user cannot count on too much and pixels will be visible when looked closely. Gorilla Glass 3 certified, the display is likewise scratch and impact resistant. The Archos Sense 50X is powered by the MediaTek MT6737T system. It consists of four cores with a maximum clock frequency of 1.5 GHz and ARM graphics Mali T720MP2 600 MHz, which is a relatively weak configuration. Fortunately, 3 GB RAM and 32 GB of built-in memory have been added to the set, so at least here is nothing to complain about. With 32 GB of built-in memory, approximately 24.5 GB is used. The phone supports microSD cards up to 64 GB. As far as the cameras are concerned, the Archos Sense 50x packs a 13 MP primary camera on the rear and an 8 MP front camera. The camera attracts decent photos, but it reacts very slowly with focusing. For example, to take a photo of a construction site, it should be fine. It is surprising to find a biometric reader in rugged devices which is not seen often. This one used in the Archos Sense 50X works correctly. Most of the time it recognized fingertip faultlessly and quickly unlocked the smartphone. Also intended for professionals, the Sense 50X embarks on a high capacity battery to guarantee maximum autonomy. In combination with energy-efficient components, it works calmly on one charge for two days.